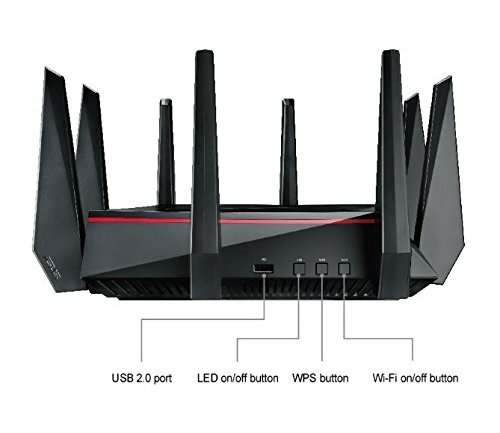 When it comes to the list of the best routers that one can purchase, it would be an injustice to omit the incredible ASUS RT-AC5300. Do you own a smart home? I wouldn’t imagine a better place. The router will definitely take your gaming to a whole new level. As if that is not enough, it is an ideal choice for 4K streaming. It will never disappoint regardless of how competitive the online game is or the number of users in your network. That is what brings us here. After extensive research, we come bearing a detailed discussion. It is a review of the ASUS RT-AC5300. For a wise buying decision, keep reading. 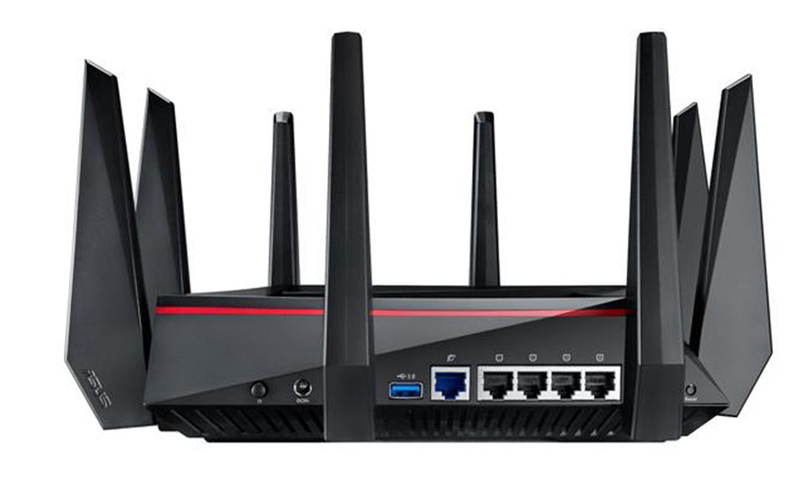 As said earlier, this is the best router that you will ever get for not only gaming but also 4K streaming. However, what makes it that effective? What does it offer the client? We are about to unveil its incredible design and great features that make it an alluring product. Read on! 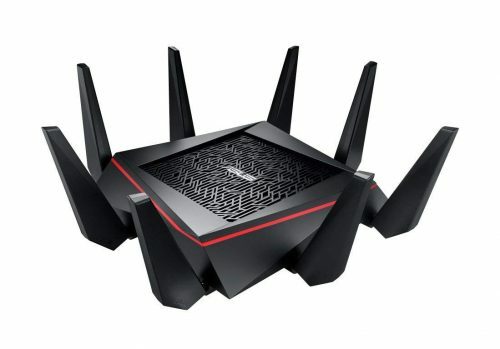 At first, it will be hard to identify how this router actually looks like. That’s because it comes in a box. Nevertheless, the box looks good and can give you a hint of what is in store for you. Upon opening, you get various layers. Each of them encloses certain parts. One such part is the aerials. The cradled aerials come in 4 pairs which are a total of 8. Upon connecting, it will look like a starfish with tails looking upward. The look is indeed beautiful. The stylish design will add beauty no doubt. Its size is generally big. Once you assemble it, its dimensions are 245 by 245 by 65 mm. Once it has even the aerials, it can cover an area of 30 square meters. The height also changes from 65 mm to 17 cm. On the other hand, its weight is 1.7 kg. Thanks to its design, it is robust. That has contributed to its durability hence value for your money. The first and foremost is the capacity. With a data throughput of 5334 Mbps, it is true beyond any reasonable doubt that ASUS RT-AC5300 offers reliable connectivity. One has the NitroQAM technology to thank for the same. To support the second further, it also uses the MU-MIMO technology. It ensures that the WI-FI speed doesn’t decrease with increase in connected devices. Its user interface is friendly. Therefore, the installation, as well as operation, will be a piece of cake. Not even the advanced settings will give you a headache. Safety is also a guarantee because of air protection. Not even advanced threats will surpass the router. It offers many stages of protection to ensure that nothing goes unnoticed. For that reason, you can rest assured that your files and computers have full protection. ASUS RT-AC5300 supports gaming with its built-in game acceleration. It minimizes ping times for a great playing experience. The AirRadar beamforming technology and antennas promote its coverage. To accommodate gadgets with different bandwidths simultaneously, the manufacturer offers the tri-band smart connect feature. Its app simplifies its operation even further. The hardware part includes a 1.4 GHz dual-core processor as well as 512 MB RAM. There are 4 Gigabit Ethernet ports, a USB 3.0 port, and a USB 2.0 port. One can use it for various purposes. Do you prefer low latency gaming? Are you a fan of streaming 4K multimedia media? Does your job description include downloading big files? If yes, this is undoubtedly the ultimate choice. As mentioned earlier, the speed is impressive. 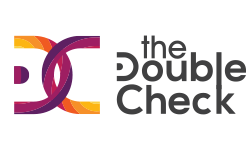 Thanks to its latest technology, it performs efficiently and supports multiple users without compromising that. In addition to that, the network performance, as well as the bandwidth, remains unaffected. Some of the contributing factors are two 5GHz bands, the NitroQAM Wi-Fi technology, and the MU-MIMI technology. For the Ethernet devices, one gets up to 2Gbps throughput. The router upload, as well as download speed, is up to 1800 Mbps. On the other hand, USB data transfer speed is 100 Mbps. With such fast transfers, it is undeniably great. From the above discussion, it is clear that ASUS RT-AC5300 has incredible features that work complementarily to make the device worth investing in. The device also has high WI-FI speed as well as data transfer rates. Therefore, the user does not have to wait for a long period when uploading, downloading or sending files. It has an Ethernet link aggregation that goes up to 2Gbps. It has various setup options that are straightforward. Its operation is also effortless. When it comes to the pocket, you will spend more than you could use to buy other routers. It has one 3.0 USB port only. The Gigabit Ethernet ports are only 4. When it comes to ASUS RT-AC5300, the setup routine is rather comprehensive. Fortunately, it comes with a quick start guide and a support CD containing a user manual as well as utility. Equally important, it comes with other necessary equipment. The box also contains the 8 external detachable antennas, power adapter, and RJ-45 cable. With the help of the guide, one can easily install it depending on how he or she wants it to operate. It can either be a router, wireless bridge or access point. It also has an On Screen Display (OSD). That takes the operation to a whole new level. The router is compatible with all the operating systems. That includes Windows, Linux, and Mac OS among others. After the ASUS RT-AC5300 review, it is true beyond any reasonable doubt that it is a router worth spending on despite the cost. It has excellent features that facilitate top speed internet and fast data and file transfers. Given the pros and cons, it is apparent that the former outweighs the latter. The spider-like design can beautify a place. Its robustness, on the other hand, ensures that its longevity is top-notch. 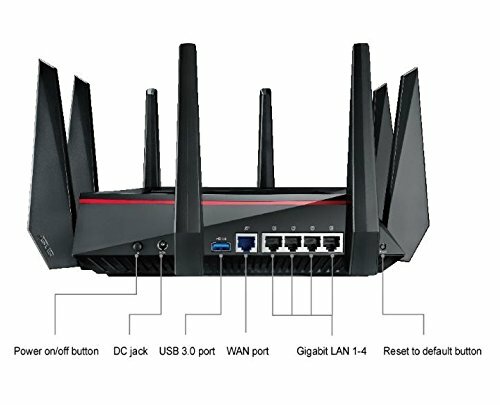 With all that in place, who would hesitate to secure this router? It is advisable to purchase ASUS RT-AC5300 for better WI-FI connections and data transfers.